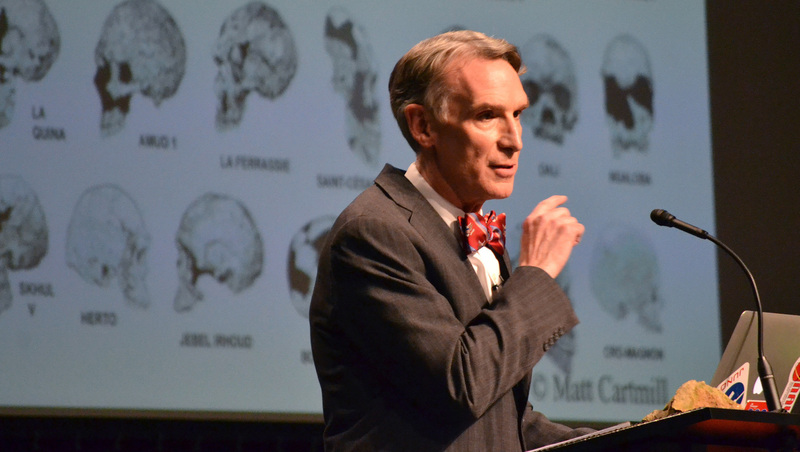 PETERSBURG, Ky. - TV's "Science Guy" Bill Nye and the leader of a Kentucky museum who believes in creationism debated a question Tuesday that has nagged humankind: "How did we get here?" Ken Ham, the founder of the Creation Museum, believes the Earth was created 6,000 years ago and that the Bible tells the factual account of the universe's beginnings and the creation of humans. Nye said he, and the rest of the scientific community, believe the Earth was created by a big bang billions of years ago and people have evolved over time. Nye said technology keeps the U.S. ahead as a world leader and he worried that if creationism is taught to children the country would fall behind. "If we continue to eschew science ... we are not going to move forward," Nye said. "We will not embrace natural laws. We will not make discoveries. We will not invent and innovate and stay ahead." Ham showed the theater audience of about 800 people - and those watching the debate live on the Internet - slides backing up his assertions. "Creation is the only viable model of historical science confirmed by observational science in today's modern scientific era," Ham said. He also introduced scientists who he said were also creationists. "I believe the word 'science' has been high-jacked by secularists," Ham said. Some scientists were critical of Nye for agreeing to debate the head of a Christian ministry that is dismissive of evolution. Jerry Coyne, a professor of ecology and evolution at the University of Chicago, wrote on his blog that "Nye's appearance will be giving money to organizations who try to subvert the mission Nye has had all his life: science education, particularly of kids." Coyne pointed out that the Creation Museum will be selling DVDs of the event. The museum quickly sold out its 800 seats, thanks in part to Nye's celebrity as the former host of "Bill Nye The Science Guy," a 1990s science education TV program that is still played in some classrooms. Some people in the audience wore "Bill Nye is my home boy" T-shirts. Another fan wore a bow tie and Nye's signature lab coat. Ham said there were hundreds of thousands of visitors to his Facebook page Tuesday, and the Creation Museum hasn't had the spotlight shined on it like this since its opening in May 2007. Nye waded into the evolution debate in an online video in 2012 that urged parents not to pass their religious-based doubts about evolution on to their children. Ham rebutted Nye's statements with his own online video with comments from scientists who work at the museum. Since the debate was announced in early January, attention has been heaped on the Creation Museum and its directing ministry, Answers in Genesis, which is raising money for a theme park built around a replica of Noah's Ark. The project was announced in 2011 but fundraising has been slow and its groundbreaking date is in limbo. The Creation Museum said visitors from 29 states bought seats for the debate.